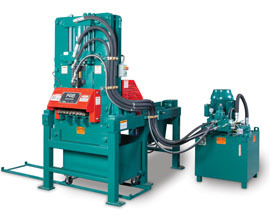 The H4100 Hydraulic Shear is the next generation of rebar shears. The H4100 guillotine shear produces 40% more force and can cut 9 - #14 (45mm), and 5 - #18 (55mm), bars on each cycle. The H4100 is the heart of the KRB next generation shearline, which has industry leading short bar handling and on-board diagnostics.